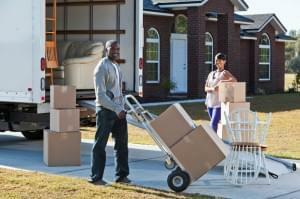 Moving is hard enough when you are relying on yourself and maybe a few helpful family members or friends. The right equipment can make the process easier and less strenuous, and that equipment is readily available for sale or for rent if you know what to look for and where to look for it. Dollies and hand trucks allow you to leverage your strength to lift heavy boxes and appliances far more easily than you otherwise could. Moving and furniture dollies are flat, square-shaped, and have four wheels, which allows you to slide large loads over smooth floors. Hand trucks are upright with a handle, a flat base, and two wheels. You stack boxes or load an appliance onto the flat base and then tip the hand truck so that you can roll the load on the wheels. Although you can leverage your strength with a moving dolly or hand truck, ropes and straps will help keep boxes, furniture, and appliances securely attached to the dolly. The ropes or straps will keep the load from shifting or tipping during the lifting and moving phases. These are especially critical if you are moving big items by yourself. For team efforts, moving straps and bands work well to lift and move big pieces out of tight spaces where you can then finish the loading job with a dolly or hand truck. Straps or bands are attached at the shoulders or forearms of one lifting team member, passed underneath the appliance or mattress, and then attached to the shoulders or forearms of the other lifting team member. Who knew a few little plastic discs could be so handy? Furniture sliders go under the feet or corners of heavy appliances and furniture. They allow you to more easily slide heavy stuff over a carpet or hard floor. Blankets and pads keep things from clanking together and causing dents, scratches, or other damage. When you are preparing to move, make sure these items are on your checklist for purchase or rental. It’s worth the cost to make the move more smooth and simple. Value Store It offers a free moving truck in certain locations (check our Home page for details) as well as an extensive selection of storage units and locations throughout Florida, New York, and Connecticut.